Type of book: Hardcover, 352 pg. Book size: 7.0 x 9.0 in. Le Mans in 2011 marks the sixtieth anniversary of Porsche's participation in the Le Mans 24 Hours. This anniversary is an ideal opportunity to provide a detailed study, packed with photos, narrative and data, of Porsche's part in the world's greatest motor race. Porsche's first visit to Le Mans was with a singleton entry of a streamlined 356 model, complete with aerodynamic fairings over the wheels. True to the reputation Porsche has established over its long association with the famous endurance race, this 356 ran like clockwork to 20th place, beating the coveted record for the shortest time spent in the pits. Since then, there have been Porsches entered for every single running of the 24 hours and the models that have taken part add up to a roll call of great sports racing cars: 550 Spyder, 718 RSK, 904, 906, 908, 910, 917, 936, 935, 956, 962 and GT1. And to this list can be added the ubiquitous 911, the privateer's choice for the race: in 1971, a year that saw a record number of Porsches take part, 19 of the 33 Porsches in the race were 911s. 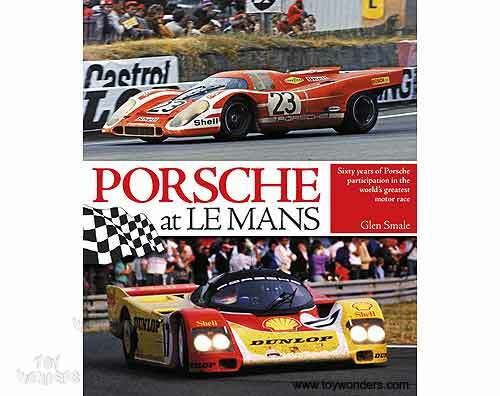 This book Porsche at Le Mans, compiled by a meticulous author with a passion for Porsche, provides definitive coverage of the subject, supported by full access to Porsche's archives of photographs, data and technical information.